As promised, here is the recipe for this dreamy, smooth, chocolatey torte, originally from Hersheys.com (although we got it from Allrecipes). 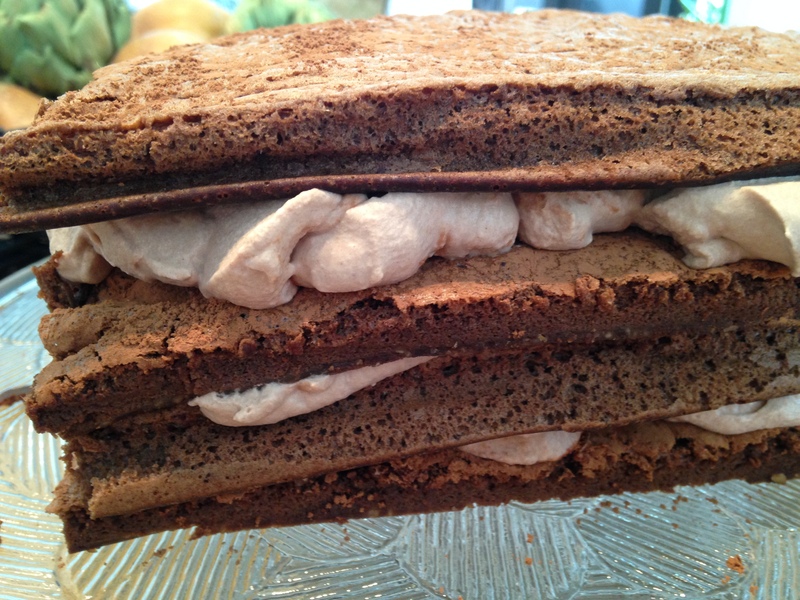 This dessert consists of four thin layers of chocolate cake, with cocoa whipped cream holding the whole thing together. Sounds pretty good, right? Believe it or not, the recipe uses no flour, no cake meal, nothing! Just some cocoa powder and nuts. Ok, ok. Time for me to stop babbling and give you the recipe. 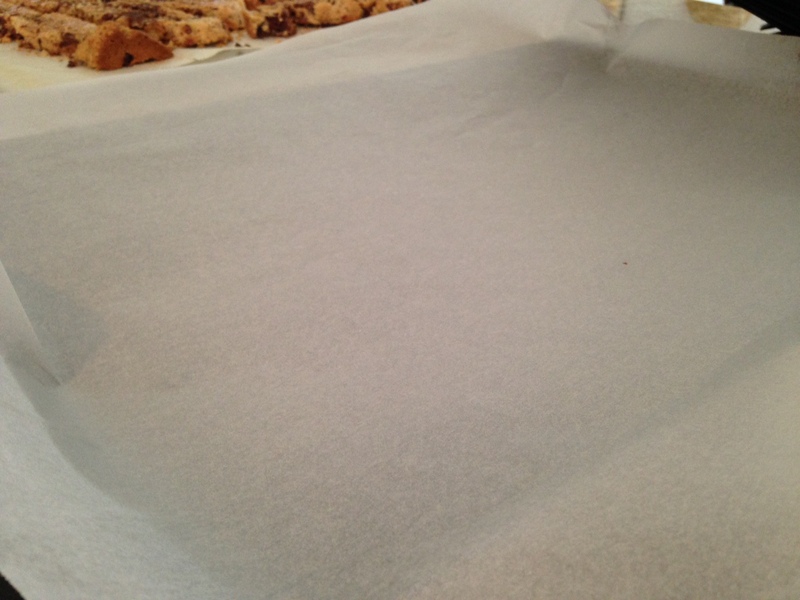 Prepare a jelly roll pan by lining it with parchment. The paper should go up over the sides of your pan. By the way, those tempting-looking cookies in the background are the Chocolate Chip Mandel Bread. 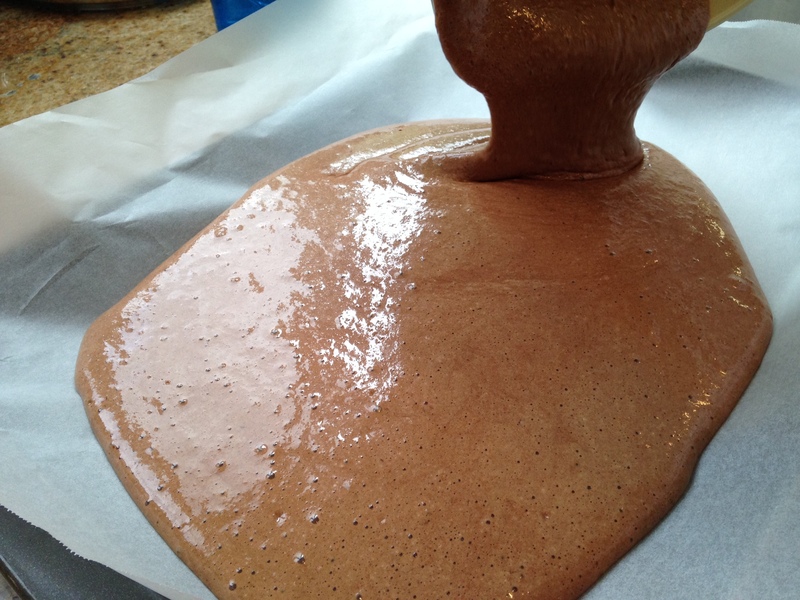 Combine 1/3 cup cocoa powder and boiling water in a small bowl until smooth. Add butter and vanilla and If you used a microwave for the water, feel free to make things easier for yourself and add the cocoa right into the microwave dish/bowl/measuring cup/thingy. Set this aside to cool and resist the urge to stick your fingers in it. 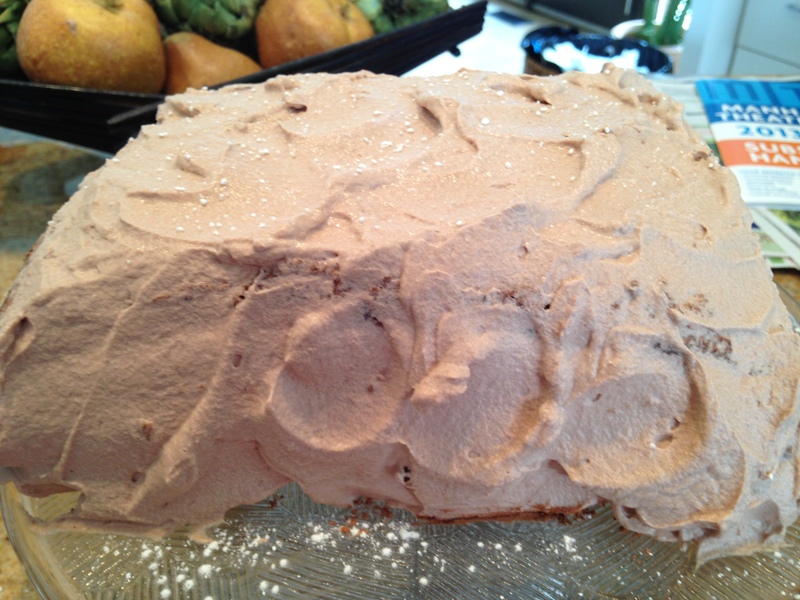 It may look yummy, but just remember that it is made with UNSWEETENED cocoa powder!!! Separate your eggs (if you haven’t already). 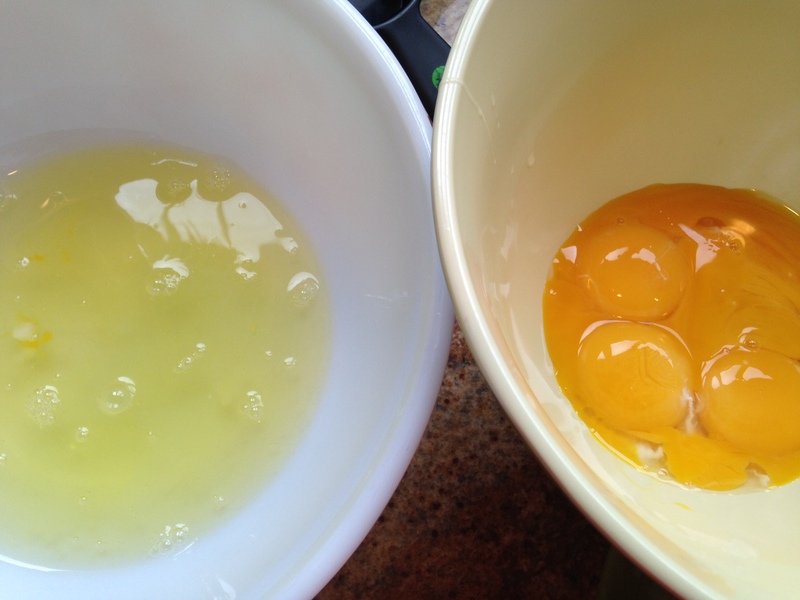 Oh, and just so you know: you’ll eventually be adding everything into the egg yolk bowl, so make sure it’s pretty big! 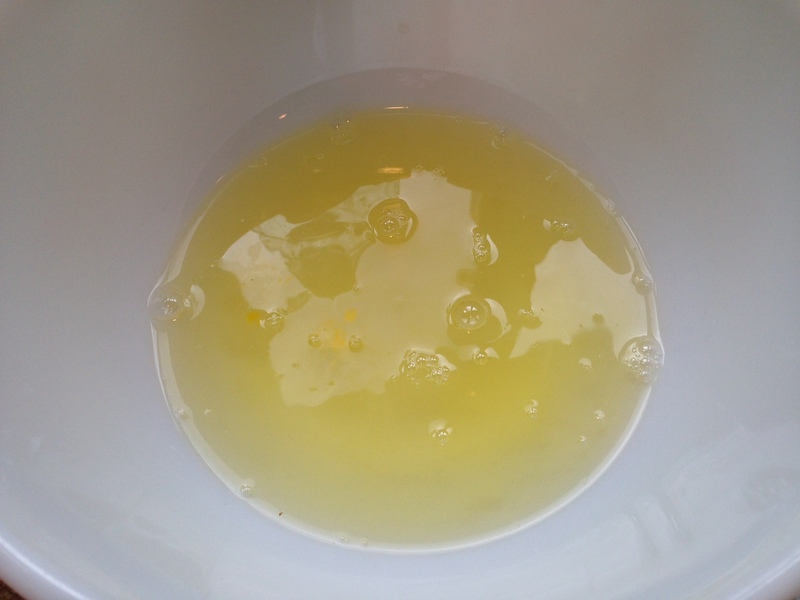 Into your egg yolks add a 1/2 cup sugar and beat on medium speed until pale yellow, like this. 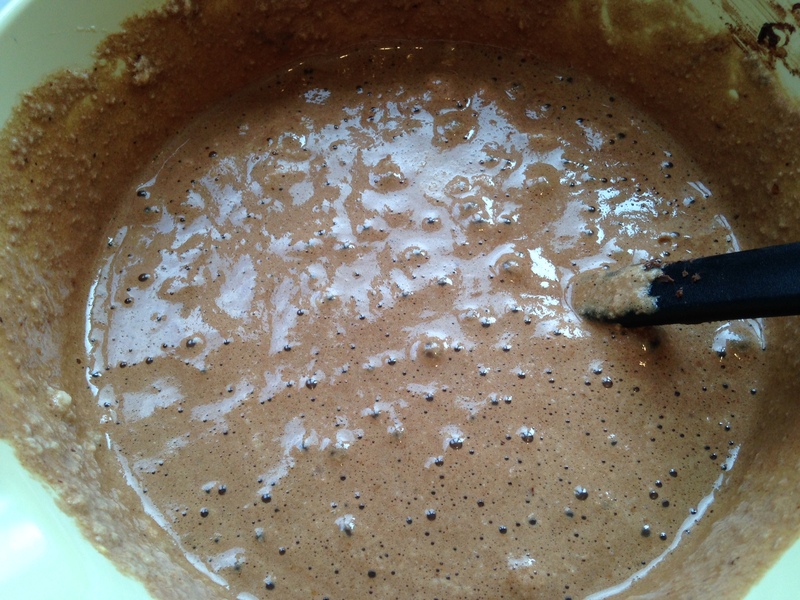 Add your chocolate mixture, which should now be relatively cool, along with the ground nuts. Beat until well incorporated. And now, back to those egg whites. You didn’t think I’d forgotten about them, did you? Beat these until foamy. No stiff peaks yet! Then gradually add the rest of the sugar (this should be 1/6 of a cup). NOW you can beat until stiff peaks form. This I neglected to take a picture of. I have no idea why. 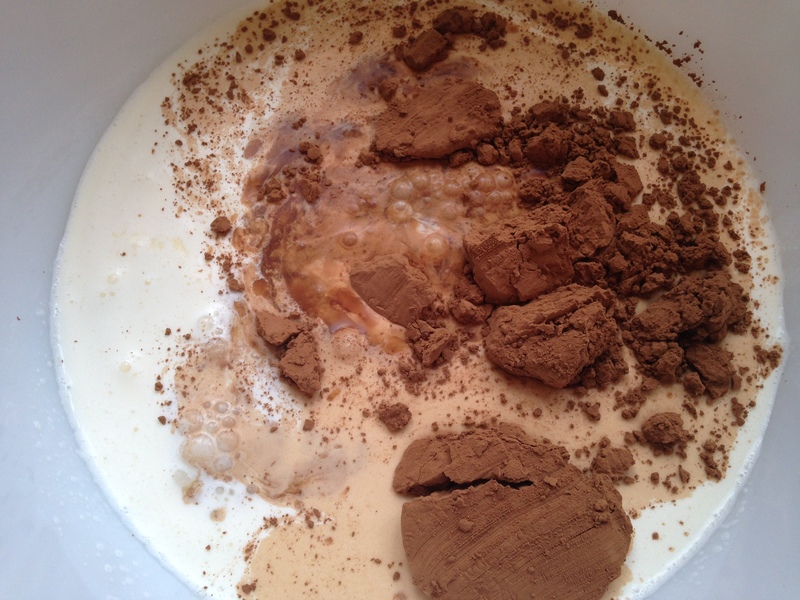 Next you can go ahead and fold the whites into the chocolate mixture, working with about 1/4 of the whites at a time. Fold until well combined, aka no more clumps of egg whites. Clumps of egg whites do not make for a very good cake. Pour the batter into your pan. Make sure it gets into the corners. Time to go in the oven! Bake for 18-20 minutes. The cake should bounce back up when gently touched in the center. While this is happening, you might want to stick a large bowl and your beaters in the fridge. You’ll find out why later. Mmmmmm, can’t you just smell it? Well, I guess you probably can’t. 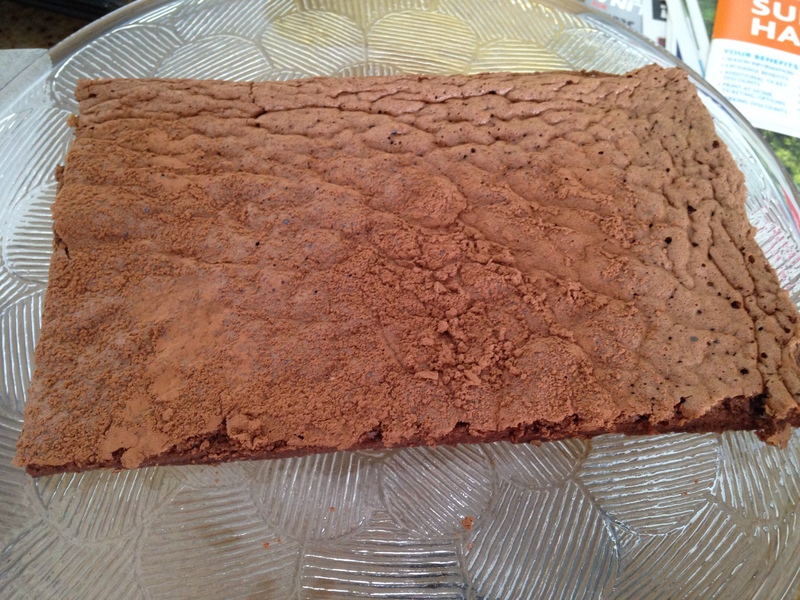 Once you’ve pulled your cake out of the oven, dust the top with the tablespoon of cocoa powder. I used an adorable mini sifter. Cover with a dry towel (which I completely forgot to do; don’t worry, it came out fine!) and let cool on a wire rack. 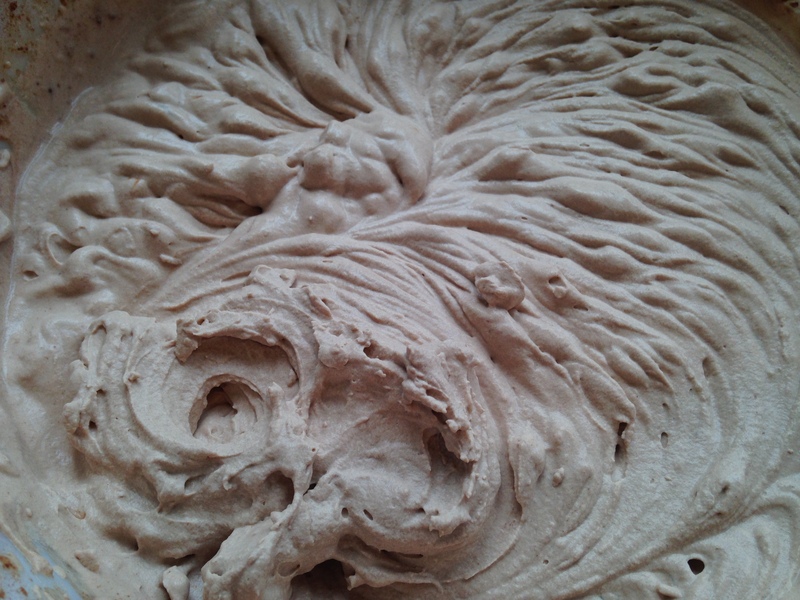 Meanwhile, instead of gazing at the cake and trying not to nibble off the edges, why don’t we make the cocoa whipped cream? In that large, COLD bowl you stuck in the fridge a little while ago, combine the COLD cream, 1/3 cup sugar, 3 tablespoons cocoa powder, and 3/4 teaspoon vanilla extract and beat with your COLD beaters (are we seeing a pattern here?) until stiff and, well, whipped cream-y. It should look something like this. I may or may not have dipped my finger in this quite a few times. And when I say may or may not I mean definitely did. Just don’t tell anyone. Ah, back to the cake. 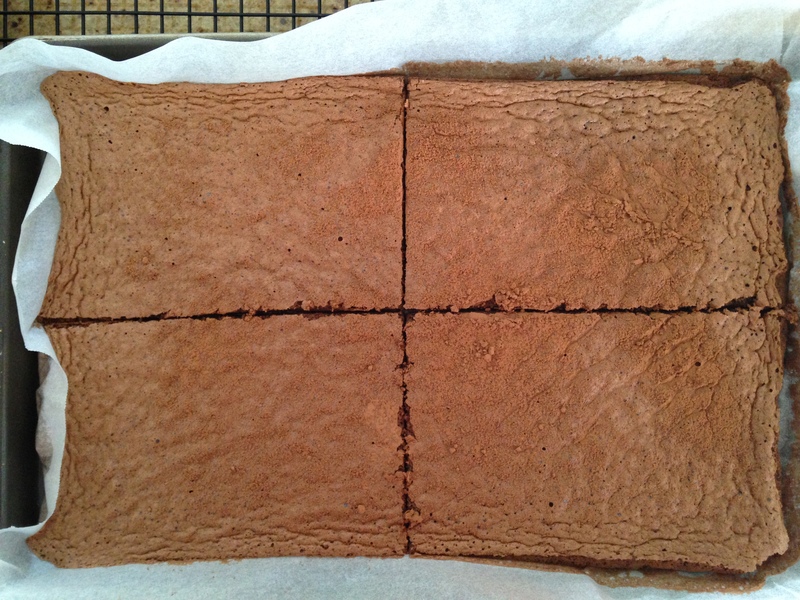 When it is cooled, cut it into four equal pieces. 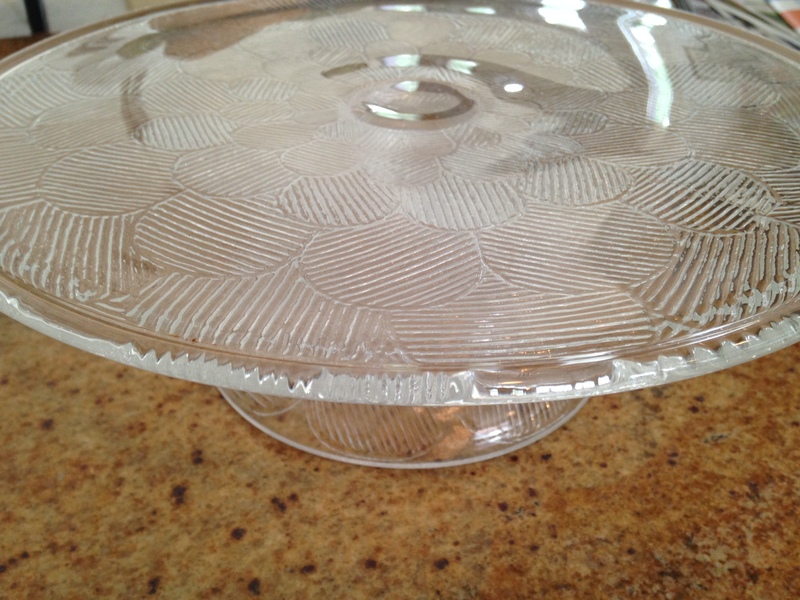 Hey, why don’t we use this super-pretty cake stand? Carefully remove one slice of the cake and place on whatever you plan to serve the torte on. Now for the whipped cream. Frost a generous layer onto the cake. NOTE: It might be a good idea to set aside some whipped cream with which to frost the sides and top. Or just play it by ear, like I did. Place another slice on top and continue with this layering until you’ve used up all of the cake. Smooth the remaining cream over the sides and top of the cake. You can use a spoon to make swirls, if you want. That’s pretty much it! Just remember to refrigerate until you’re ready to serve. I sadly was not able to snap a picture of the cut-open cake. Oh well. 1. 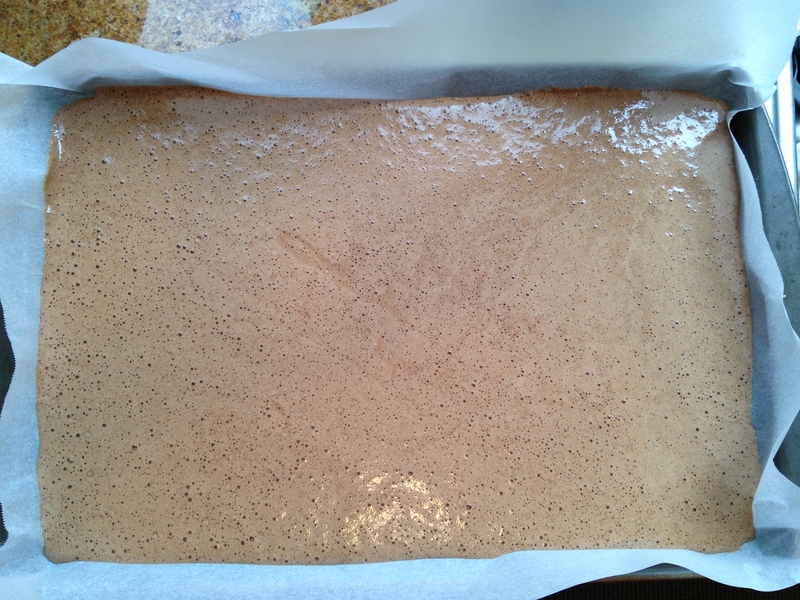 Heat oven to 350 F. Line a jelly roll pan with parchment paper, making sure that it comes up a little over the sides. 2. 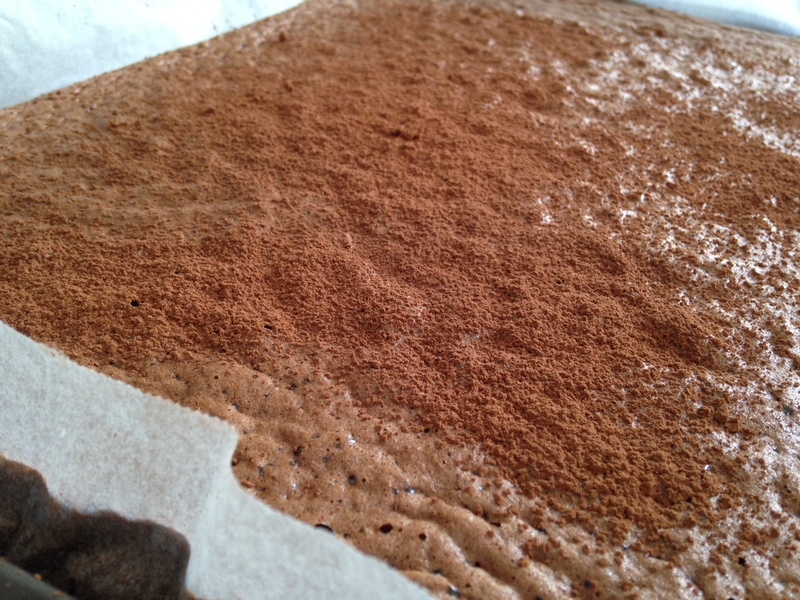 In a small bowl, combine boiling water and 1/3 cup cocoa powder until smooth. Add butter and vanilla and set aside to cool. 3. 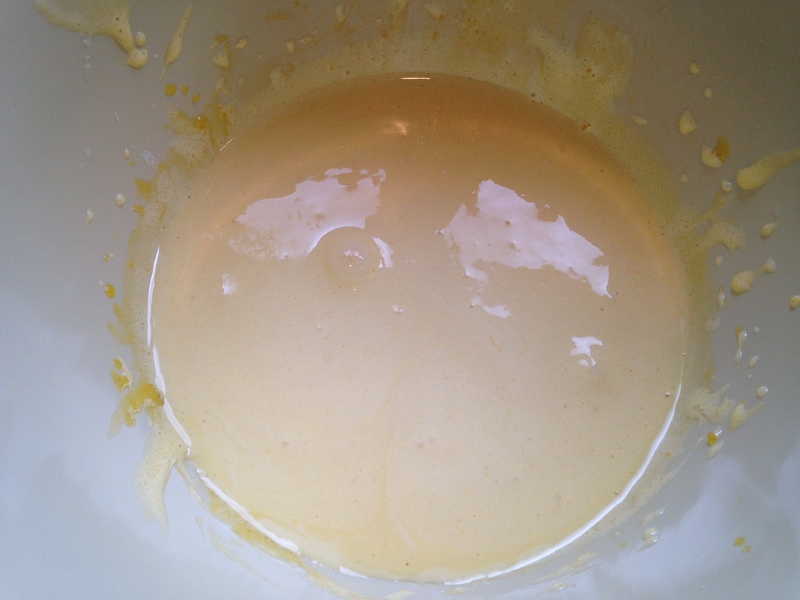 On a medium speed, beat egg yolks and 1/2 cup sugar for a few minutes, until pale. 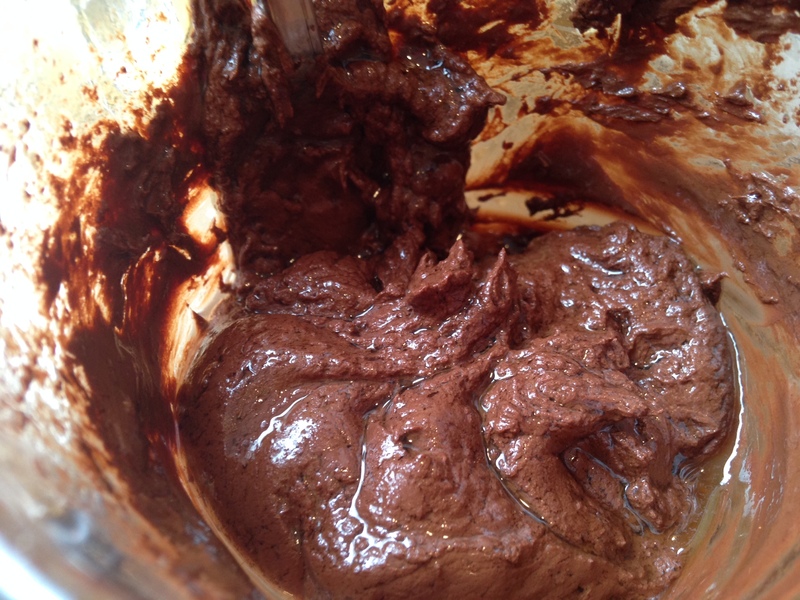 Add cooled chocolate mixture and ground almonds and beat until well incorporated. 4. 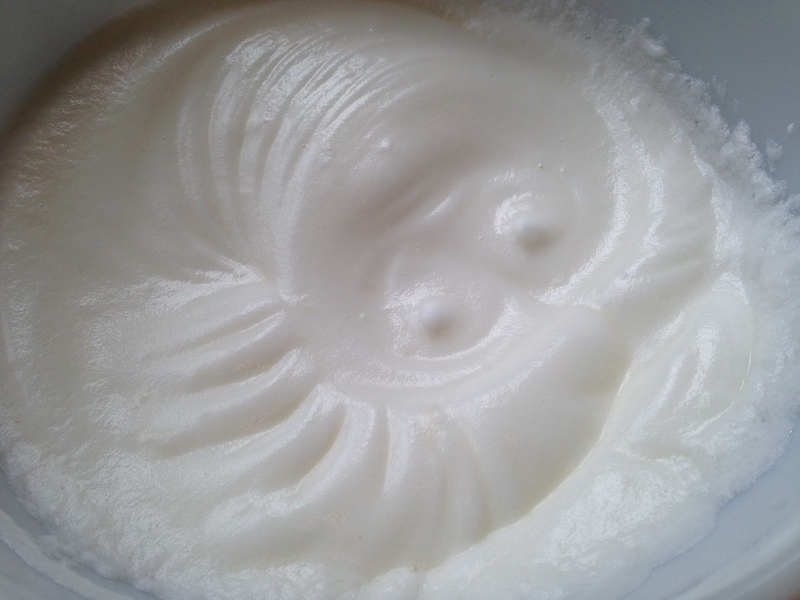 In another bowl, beat egg whites until foamy (not stiff peaks). 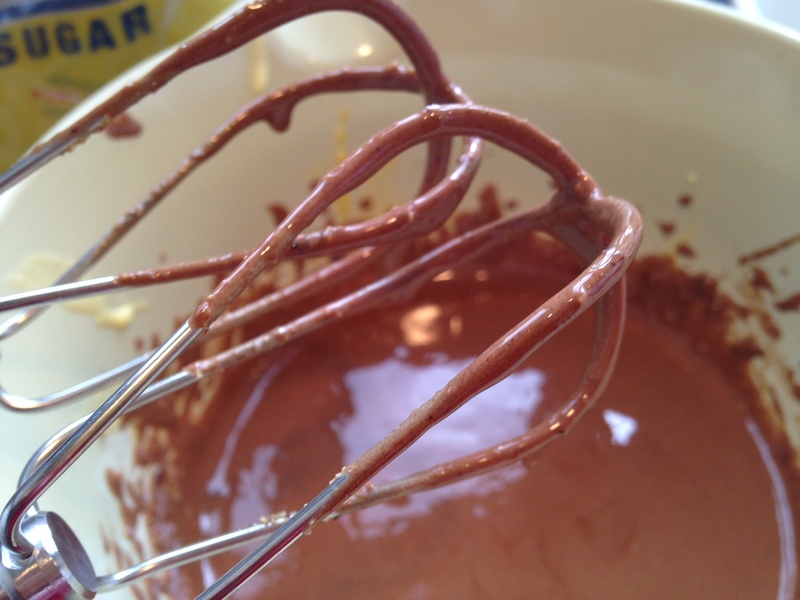 Add remaining 1/6 cup sugar gradually and beat until you see stiff peaks. 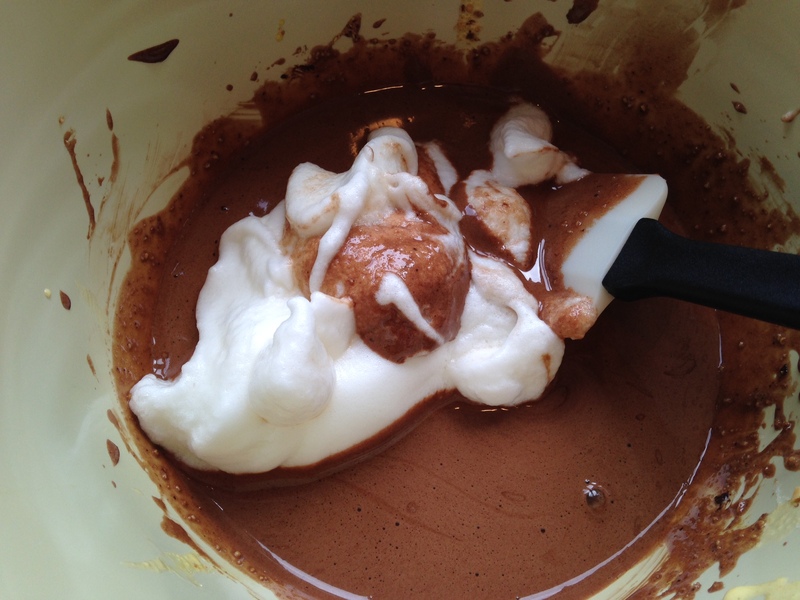 Fold eggs whites gradually into chocolate mixture until everything is well combined. 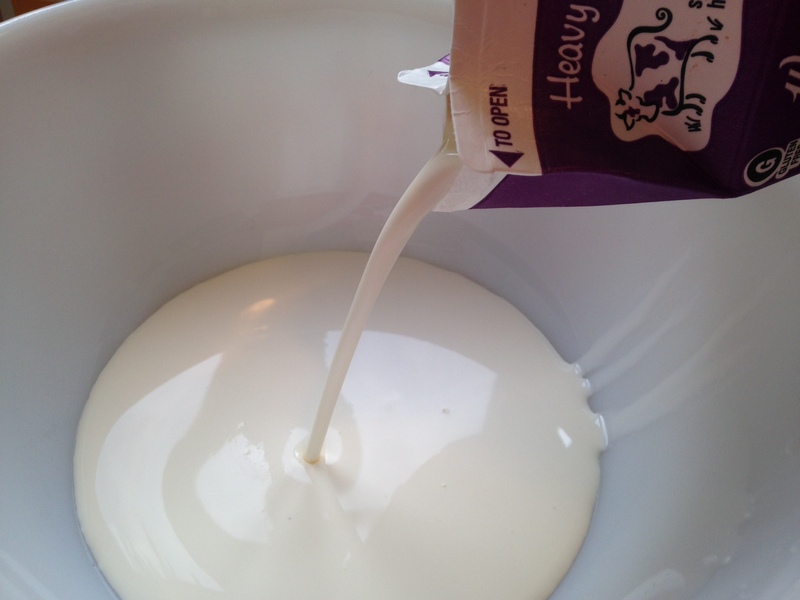 Pour this into your pan and bake for 18-20 minutes (when gently touched in the middle cake should bounce back). While this is baking, put a large bowl and your beaters into the fridge. 5. When cake is out of the oven, dust the top with 1 tablespoon coca powder and cover with a dry towel (though I didn’t cover mine and it came out fine). Allow to cool on a wire rack. 6. While this is cooling, take your bowl and beater from the fridge and in this bowl combine cream, 1/3 cup sugar, 3 tbsp cocoa and 3/4 tsp vanilla. Beat until stiff. 7. When the cake is cool, cut into 4 equal pieces. 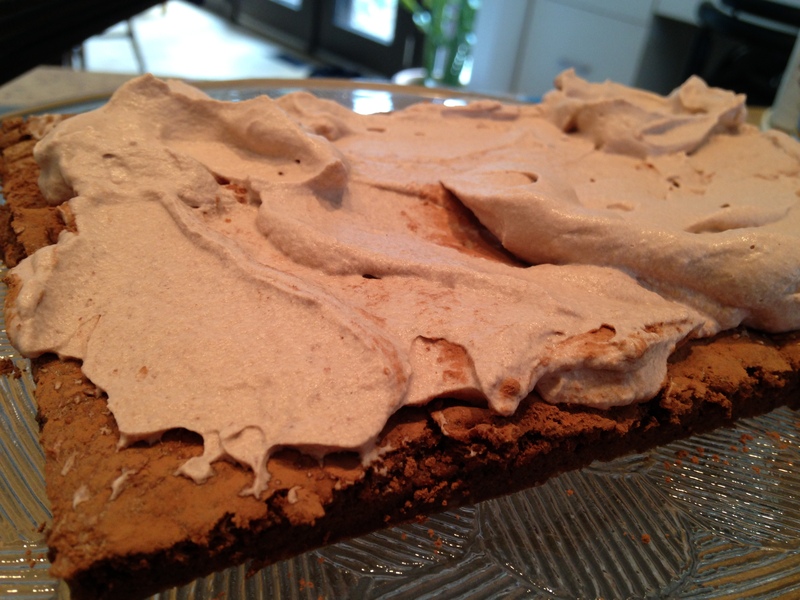 Place one slice on cake stand/serving plate and apply a generous amount of whipped cream. Set another slice of cake on top and repeat until all of the cake has been used. 8. 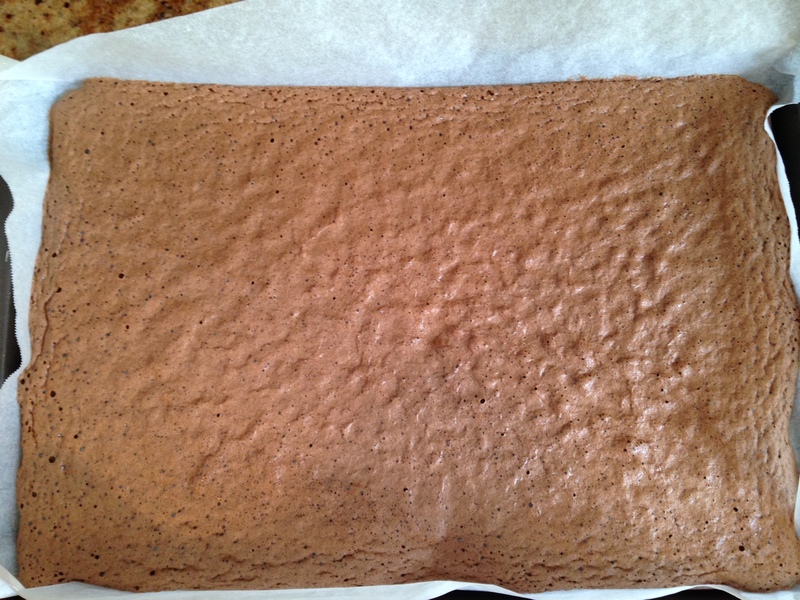 Smooth remaining cream over sides and top of the cake. Hope you like it, and happy nibbling!